Following the successful launch of IP Inclusive‘s Women in IP group last November, the group has been busy organising future networking events, seminars and discussions. Many attendees of the November launch event were keen on there being more regular networking events for women working in the IP professions. So, the Women in IP group have launched informal ‘meet up’ events, the first of which took place on Monday in Manchester. The ‘meet up’ events are open to all women working in IP. Paralegals, patent and trade mark administrators, technical translators, technology transfer staff, legal secretaries, members of the IPO, etc. are all very welcome and encouraged to attend. These events are not just for IP attorneys and solicitors, and you do not have to be members of CIPA, ITMA or any other legal institute/body in order to attend. Sarah Brearley, Associate Patent Attorney at Mewburn Ellis LLP and one of the leaders of the Women in IP group, organised the first event in Manchester. As part of our program of events for 2017, the IP Inclusive Women in IP group are organising a series of informal “meet up” events around the country. The idea is simple: at a given time, in a given place, there will be at least one recognisable “Woman in IP” and you are invited to pop along, say hi and to get to know us and each other a little. Now, “how do I recognise a ‘Woman in IP’?” I hear you ask. We have a fool proof identification technique. Look for a copy of the relevant institute or other trade journal. [Ed: Or look out for someone prominently displaying the IP Inclusive logo]. Then, grab yourself a coffee / glass of wine / smoothie, and sit down for as little or as long as you like. 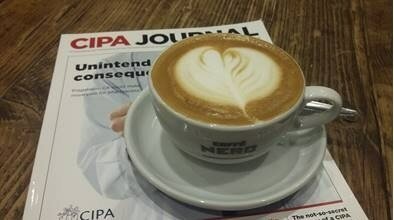 Our first event was held on Monday 23 January in Manchester, from 7:30-8:30am in a city centre coffee shop, with the CIPA journal displayed prominently on the table. On Wednesday 01 February, we have a “meet up” in London at the Taylor Street Baristas from 8:30-9:30am, just off Chancery Lane (25 Southampton Buildings, London, WC2A 1PN). If you work in the area, please do come along. We’ll vary the location, and time, of our events throughout the year, so hopefully as many women as possible can come along, meet each and continue to build a “Women in IP” network. If you have any suggestions for locations please let us know. Thanks Sarah, for organising the event and for this write-up! We hope that more Women in IP meet ups will be popping-up around the country in the next few months! Check this blog and/or the Women in IP LinkedIn® group for info about upcoming events.